Of all continents, Australia is the least geologically active. The landscape is ancient, including some of the oldest rocks in the world. The only mountains are on the eastern edge of the continent. The B59 road across the Blue Mountains from Windsor to Lithgow is one of my favourite drives, with spectacular views (a head for heights is helpful). The steep rock sides and deep canyons form a seemingly impassable barrier to the vast lands further west. Southward, the Tidbinbilla mountains are ruggedly beautiful but can be cold. A Koala bear was shivering in the rain half way up a small tree. A platypus was playing in a large pool, coming within meters of us on this grey day. This ancient land has a mountainous edge. Volcanoes are signs of youth and seem out of place on this continent. But they are here, and some are surprisingly young. Even today a new eruption is not impossible. Like the mountains, the volcanoes are all on the eastern side of Australia, in a series of chains running north to south, starting 500 km of the northeastern coast (the Maer islands) to Tasmania in the south. The total length is 4400 km. That is a sizable sequence! It closely follows the Great Dividing Range, the third longest continental mountain chain in the world. There are also two chains of submarine volcanoes further to the east, off the coast. Not surprisingly, the cause of these volcanic chains lies underground. Australia is the world’s fastest continent. Continental drift is moving it north (10 degrees east of north, to be precise) at break-neck speed, 7cm per year. 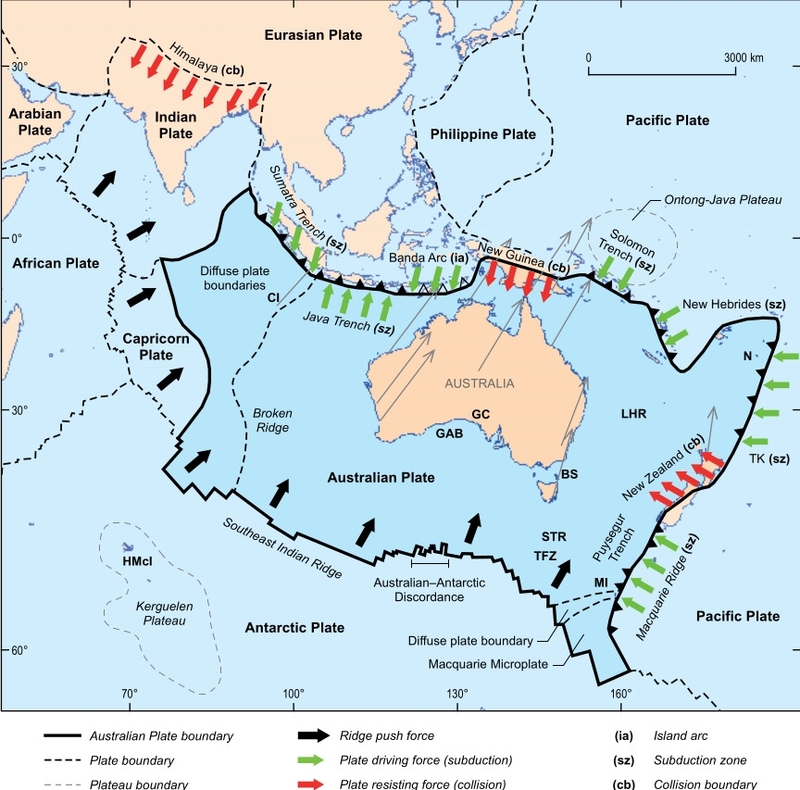 While speeding along, the continent has been traversing a broad hot ‘spot’ underneath the continent, and the chain reflects the movement of the Australian plate over this region. The northern edge of Australia reached the hot spot (or warm region) perhaps 40 million years ago . At the current time the warm region is located near Tasmania. While Australia drifted over it, magma generated by the warmth (including some crustal melt) found weaknesses in the crust through which it managed to erupt. The result was a series of lava fields and volcanoes, stretching across eastern Australia. Unlike most mountain ranges, the Great Dividing Range is not caused by collision or subduction. In fact it isn’t really a mountain range at all. The entire area was uplifted by as much as one kilometer. The eastern edge of the uplifted region sloped towards the sea. Rivers on this slope caused erosion, and turned the slope into a steep edge which was slowly forced back into the land. Climb up the steep slope, and you will find that what is a mountain from one side, is an escarpment from the other. The uplift started around 80 million years ago but different parts of the range do not all have the same age. The current edge of the escarpment was reached about 3 million years ago: it has been fairly stable since. Volcanoes occur both on the escarpment and on the eroded plains, but only one lava flow, a young one dated at 3 million years, comes over the escarpment. 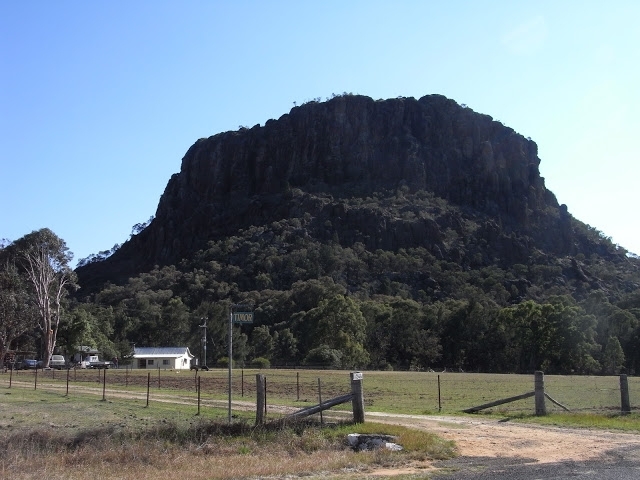 The largest of the volcanoes was probably Mount Tweed with its peak Mount Warning, on the coastal plains. It was between 2 and 3 km tall and had a volume of 4000 cubic kilometer but it has been eroded down to a remnant. One has to be amazed, and echo Lady Macbeth: Who would have thought the old man to have had so much blood in him? Mount Warning is not a volcanic neck, but rather a solidified magma chamber, dug out by erosion which removed the softer rock surrounding it. Why do the volcanic chains follow the Great Divide? There is no close connection between them. In spite of its speedy drift, Australia is not subject to great tectonic stress. But there is some compression acting on it, in the east-west direction, caused by New Zealand. The centre and west of Australia have very thick crust and lithosphere and are hard to push. Any fault lines caused by the compression are therefore located on the younger, eastern side. 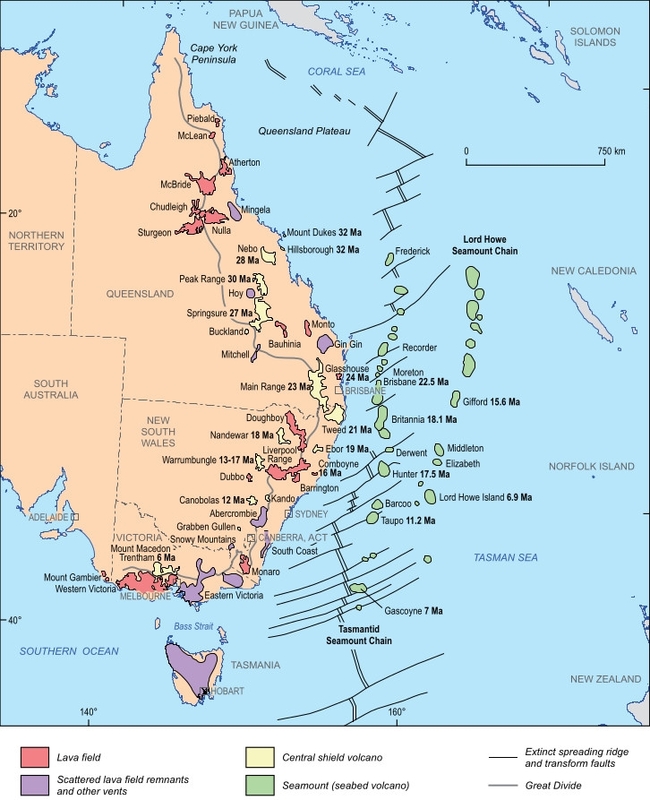 (Over geological times, Australia grew its crust mostly from west to east.) It may be that the volcanic chains follow compressional fault lines, perpendicular to the stress. The faults weaken the crust and allow magma to push its way up. We should not assume that each chain segment necessarily shows a separate mantle hotspot. The condition of the crust plays a role. A small weakness can act as a chimney, funneling the heat towards it and up. In a way, the Australian volcanoes are like the chimneys of Mary Poppins. The thickness of the lithosphere also acts as a barrier. Gaps in the chains have been attributed to places where the lithosphere is too thick. This keeps the warmth deeper down, under too high pressure to allow for decompression melt. The highest melt fractions occur where the lithosphere is thinnest. The lava fields may have a slightly different origin: there are suggestions that they come from edge convection, material traveling sideways along the bottom of the plate. This would explain why the newer volcanic region is some distance away from the main track. Where did the warm region or broad hot spot come from? That is unclear, but a clue may be found in the fact that the two submarine chains, almost a thousand kilometers away, show exactly the same age gradient as the ones on the continent. Even more striking, volcanic mounts in different chains at the same latitude have the same age. It seems that the spot is stretched out along an east-west line. A warm, linear region sounds like the remains of an ancient spreading ridge. The most recent eruptions have been at the end of the chains, in Victoria, forming a volcanic plain stretching westwards from Melbourne. Lava has erupted from nearly 400 locations. The most recent eruption was an explosive one, on the western edge in a region called ‘newer volcanics’. It was from Mount Gambier, and happened around 5500 years ago. The eruption or sequence of eruptions formed a series of ‘maars’ (lakes) of which the Blue Lake is the most photogenic. It hosts fresh water stromatolites. 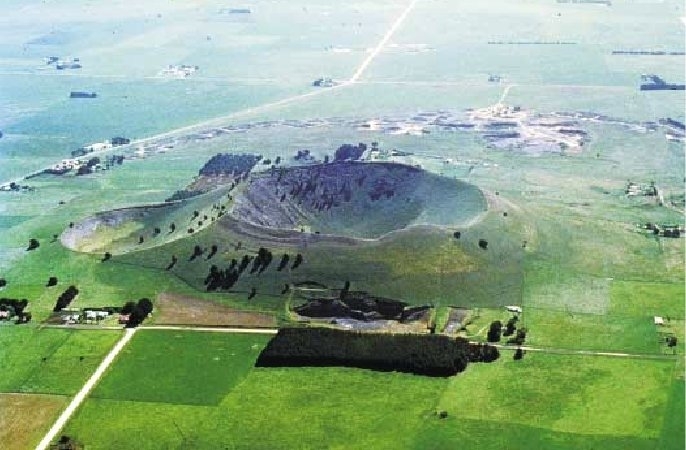 Nearby,, a little south of Mount Gambier, the ash cone of Mount Schank could even be a little younger, at 5000 years although aboriginal legends suggest the eruption at Mount Schank was earlier than the one(s) at Gambier. 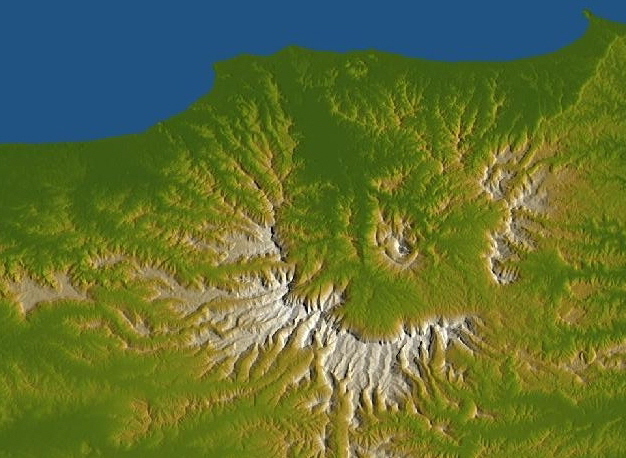 Other volcanoes in this region, such as Mount Napier, are dated to 33,000 years ago. These eruptions were small. Volcanism here has been intermittent but is not extinguished. Future eruptions are certain. But with an average time between eruptions of order 10,000 years, it may not happen any time soon. 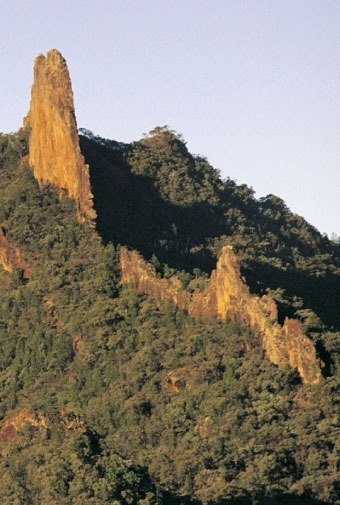 An excellent place to see an Australian volcano is in the Warrumbungles National Park, New South Wales. It is a 7 hour drive from Sydney, starting with the Richmond to Lithgow road across the Blue Mountains and stopping for lunch in Mudgee. The undulating landscape along the way is Jurrasic sandstone (so much of Australia is build on sand). Coonabarabran, with its mini Back-to-the-Future clock tower, is a good place for dinner. After Coonabarabran a low mountain appears on the horizon and the road begins to rise. Eventually it tops a ridge 500 meters above the undulating plain, and drops into a valley beyond, surrounded by ragged ridges. (The Aboriginal word Warrumbungles means ‘crooked mountain’ – all this land once was theirs and their names and history are everywhere.) Go too far and the road, now unsealed, enters the never-ending plains of western New South Wales – best to turn back. The national park is partly grassland, partly wooded with a variety of gum tree species. The white gums make a striking contrast with the black cypress pines. The park has suffered extensive fire damage recently. Grass trees, seen at higher levels, are a curious combination looking like a stump in need of a haircut. Kangaroos are everywhere: they make driving hazardous in twilight by their unerring tendency to jump in front of the nearest car. In the evening, the booming sounds of emus can be heard. 15 million years ago, this was a shield volcano, 1 km high and 50 km across build on the sandstone. Unlike the much larger Mount Tweed, the rocks were formed in real eruptions rather than from underground solidification. The lava flows of the Warrumbungles amounted to 500 cubic kilometer, erupting over a long period of time, estimated at 2.5 million years. The old shield is now largely eroded away. The much harder dykes and volcanic plugs were more resistant to the Australian rain (when it rains, it pours) and now stick out above the rest: the innards of the volcano visible in the crooked ridges and mini-mountains. The most spectacular of these is the Breadknife: a rock 90 meter high, but in places only 4 meters thick. It is clearly the skeletal remains of a volcanic dyke. A footpath, difficult and steep, runs around the entire base. Climbing the knife is no longer allowed as even this hard rock can be fragile. A Japanese children’s tv program from the 1980’s, on the fictional adventures of a koala bear, plays beneath the Breadknife. Originally, this dyke was deep underground, and the koala bear would have been better off as a cave bear. The program perhaps missed a trick by not using the setting to show-and-tell geology. The tallest mountain in the park is Exmouth, 1206 meters high, where some of the volcanic shield can still be seen. The view from the top is spectacular, a reward for a long and hot hike. The lava is seen to be stratified, with pyroclastic tuffs and breccias. The pyroclastic deposits can be recognized elsewhere in the park, including the area around the Breadknife. Trachyte is common in the central areas. The lavas lack primitive mantle components and crustal melt is indicated. Grey or white diatomites deposits, fossil algae covered in chalk, are found around the edges of the old volcano. There were lakes here during the volcanic era, perhaps heated by the activity. The chalk is now mined, for use in swimming pool filters. In Australia, people find a use for everything, even its fossils. 16 million years ago, the first flows of the emerging volcano were probably the thick trachyte lavas, erupting from a variety of vents over a larger area and forming a number of separate domes. The trachyte eventually gave way to more fluid lavas, with intermittent explosive events, which filled in the gaps between the trachyte domes. This formed the large shield. The youngest flows were the least viscous and travelled furthest, but were also the thinnest. The lava in this phase was more basaltic: hawaiites and trachyandesites. Erosion has removed the basalt and left the harder trachyte domes. Australia’s volcanic heritage is hidden in its vast landscapes. Nothing here is what it seems. Mountains aren’t mountains, deserts turn into lakes at the whim of the weather, subtropical Sydney shares its seas with penguins. It is no surprise that here, volcanoes travel, perhaps following faults generated by pressure from New Zealand. Aboriginal legends, the longest memory on earth, may recall the most recent eruptions. One day there will be another eruption. There is life in the old lady yet. An outline of the geology and petrology of the warrumbungle volcano: M. Duggan and J. Knutson, 1986. Australia in time and space, R. Blewett, B. Kennett, D. Huston, 2012. Published in: Richard Blewett (ed. ), Shaping a Nation: A Geology of Australia, Richard Blewett (editor), ANU ePress, Canberra, pp. 49-119. Dear readers, originally we had planned for today as the date of publication but due to recent developments, we have been asked by a third party to hold publication for another two weeks. Our apologies for this delay! Thank you Albert! Once again a beautifully written and informative article, one can almost see the tiny platypae swimming around! Looking at that map from Kennett, there are three separate and parallel “hotspot tracks” with the easternmost (Lord Howe Seamount Chain) trailing the other two by about 5 – 8 million years (variable). This raises the question whether there indeed are three separate hotspots or if there is one, much larger and diffuse hot region that opportunistically breaks through areas of weakness that happen to lie along parallel lines (as mentioned by Albert). If so, what caused those lines of weaknesses in the crust, why do the two western ones seem to advance in tandem while the eastern one lags behind? In what way, if any, is the “extinct spreading ridge” connected? When someone comes up with a GUT for hotspot volcanism, this region may prove to be a challenge! I tend to favor the idea of a ribbon or sheet of upwelling material in the Mantle. The individual hotspot tracks being the local manifestation of where leading edges of the plume heads of the ribbon impinge upon the crust over time. appears to have been shut down. There was another cam with a very similar view – must be on the same building. Possibly JMA? Anyone have the URL for that? Thanks! 😉 Strange coincidence is it not, that once we publish a follow up on Aso, the Japanese begin shutting down access to the webcams. One by one… 😉 At least that’s what the Nibiruists and tinfoilers will want to believe. Try this link, it is also from the building at the parking lot. In Australia in a week’s time or so as well as at Twickenham today! Always had a soft spot for the Silver Ferns as well as the All Blacks. Yes, I had noticed the coincidence. The rugby world has become the Gondwana cup. Next time they should get a team from Antarctica to join in. I can’t think of anything more terrifying than a n emperor penguin running at you at full speed carrying an egg. An image worthy of halloween. … fyi, the very mechanism making those notes is believed to be the same that generates harmonic tremor. Fluid (gas) through a resonating structure. If you ever turn on a water faucet and hear the water flowing through the pipes… that’s what you have. Btw… based on previous data digging, specifically on birth rates by month, then backing up by the requisite 9 months… this is the peak breeding season in the US. Nordic countries have theirs around the time of mid summer. Given the amount of partying that accompanies this time of year… it’s not really that surprising. Its still a Harvest festival culture. Yeah, I have the data to back that up, but I’m trying to go to sleep right now… and not doing a very good job of it. Interesting, view of Cotopaxi at 8:33 UTC (Saturday) shows volcano with night sky and stars are easily visible too. But what is also interesting is that there seems to be a glow in volcanic plume as if there was hot rock near top of inside of crater causing reflection on plume. I doubt that these cameras have IR capability. Comments? Could it be moon light? Doubt it, it seemed to be pink or reddish right where plume was leaving vent, rest of cloud white and perhaps darkish. Atm, I am unable to get cameras. Great read ! I never knew so much happened on such a quiet and peaceful island. I would love to be around in a few million years to see what happens to Australia as it heads north. In response to Henrik’s comment above, on the ages along the Lord Howe seamounts: there are only two measured ages and it would be nice to have a few more. But they do seem to suggest that there is a time lag between this and the more western volcano chains. If I draw a line connecting volcanoes of the same age, this would be mostly east-west but turn northeast as it approaches the Lord Howe chain. If your see the chains are 5 separate hot spots, than four are closely aligned and the fifth is lagging. 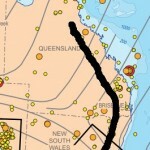 below is am image of the stress lines in Australia. In New South Wales, the stress is mostly east-west as I mention in the post. Further north, the stress lines turn north east. Now I have drawn a rough line connecting the mainland volcanoes. This line is mostly perpendicular to the stress field. This to me suggests that the volcanoes do follow a stress-induced crustal weakness. Note that this is not the line of travel of the hot spot: that is much more north-south. Volcanoes appear where the hot spot/hot line hits this weakness. The Tasmantid chain follows the old spreading ridge which formed the coral sea, perhaps 60-80 million years ago. This ridge has long been inactive, but provides a funnel for the hot spot below. That line suggests that the Australian plate may have rotated ~45 degrees clockwise as it struck the Indonesian one. Have to check ages though before making this assumption an assertion. Interestingly, you are both right and not quite right. Australia changed direction from northwest to north by northeast (don’t mention the movie), about 45 degrees, 50 Myr ago when there was a re-organization of plates around the pacific. However, although the numbers match, it happened too early, and if you draw this on the map it goes exactly the wrong way around for your idea! The stress lines change direction because of the effect of different plates: emanating from New Zealand in the south east but from Indonesia in the northeast. The hotspot(s) moved almost due south. Imagine a line drawn east-west over the north of the map, and slowly pull this line southward. For every degree southward movement, put a cross on the map where the east-west line crosses the fault line and label it with the time. The crosses show where and when the volcanoes form. But only volcanoes directly south of each other come from the same part of the hot spot, and may be expected to show related lavas. This also flies in the face of the antipodal Hotspot idea. Yes, the spot is mostly stationary (not entirely though – they can move by some degrees latitude/longitude) and it moves south only because australia moves north..
That a “reporter” would write such an article, trolling for readers, is without question. Personally, I’m not taking the bait or kowtowing to the whims of some lonely “reporter”, desperate for attention. An ad hominem attack against the reporter? Yeah, but reporters deserve it. They aren’t much different than Lawyers with regards to integrity. Other than that, a decent link that voices an alternate opinion. Has anythink been hapening at Hakone lately? and the nature of the Tectonics of the area..
For the confused. I am Geolurking. No, this is not a sock puppet account. Its my phone. Why the strange name? Well, fighting the login sequence was a pain so I just made an entity for my phone. Since my real name has no direct translation to english, transliterated to elder furthark runes it means what this login name is. It seems quite stupid, so I used it. OT but I thought this interesting enough to share with the lurkers. I particularly like the way the article ended. I think the incorporation of features better suited for northern latitudes strengthened our ability to live there. Neanderthal had been adapting to it for multi-thousands of years, and we derived the benifit from it. That makes me smile. My wife complains of my (UK) Newcastle heritage, where I am happy to work in snow and ice in a t-shirt and jeans. I’m usually about in a t-shirt or polo shirt in the coldest of weathers. I hate wrapping up, I like to feel that breeze and cold at work on me! It gives energy like no other. Neanderthal genes may have contributed to pale skins and red hair but that has also developed independently in homo sapiens. (But I don’t think there ever were neanderthals in Scotland – native americans may have had more exposures during their migrations to the promised continent.) Attributing other characteristics to borrowed genes has been more speculative. We have come a long way: two decades ago neanderthals were still viewed as primitive. Now they are seen as contributing positively to our gene pool! In Australia, Aboriginees were seen as primitive. It is one thing to do this with our long extinct cousins. Doing it to other people living around you has done immense damage. I have a pet theory that Homo Sapiens is already extinct. Only Homo Stultus remains. Cultural evolution going backward. Education seems underrated these days. I hope this blog helps a little bit by encouraging people to learn, think and share their knowledge! My wife tells me that the strongest effect on children’s learning is fathers (not mothers!) reading to them. Perhaps we should publish some posts with suitable reading material. Adventures of the volcano family.. Being carnivorous omnivores, HN ought to have been more intelligent than HS as predators usually are more so as well as having greater powers of observation – else they starve and do not pass on their genes. Apart from the proclivity for fair skin etc, there are other HN traits to be found in modern humans such as the enlarged lung capacity observed in some (7-9 l as opposed o 5½ l in males) and skull shape. Thus, anyone with a high level of intelligence, fair hair and skin with an enlarged lung capacity as well as a skull longer than broad is probably a HN descendant. Norwegian, Dane,etc. from northern Europe. “Savages” … yeah, right. Many years ago, half my family tried to kill off the other half…. best I can figure is it was all because of the non Caucasian grandmother than some of them had. Since that line had been in Mississippi from at least 1790, it’s pretty likely that the inter-relationships are far and wide. It’s been said (family lore) that the reason some of us are brown eyed is because of that. The origin of Native American Indians has been much researched. While visiting the Musee National de Prehistoire in Les Eyzies-d-Tayac-Sireuil not far from the famous cave of Lascaux we were fascinated by the display of artifacts and skeletons, etc. They had a beautiful display of arrowheads from the region – some of which had the same fluted shape as the well known Clovis points of New Mexico. What was interesting was the depiction of the early people in the Lascaux region. They commented on the the similarity of these people to most of the North American Indians. Long, somewhat arched nose and Caucasian eyes (vs oriental). They discussed how the Amerindians may of migrated to North America via the Bering Strait ice bridge or perhaps by boats (canoes) along the coastline. Yes, early humans did breed with other similar races just like the wolf has with coyote and dogs or the other way around. Hopefully more and more people will stop seeing evolution as some kind of force that propels an organism ever upward or from a to b, and realise lineages are often braided and even looped. Interestingly the early original British were described as short, black-haired and tanned by the Romans and Celts. That could describe the Cornish quite well. There appears a lot of Spanish connections in that area. If you want to know about some more ancient Australian Volcanoes. The Argyle Diamonds were found in lava tubes that date back 2.5 to 3.5 billion years. i.e. the diamonds were formed by volcanic pressure at that time. Did you know that central Australia was under the sea only 10,000 years ago? You can walk around the desert and pick up sea shells. This was mentioned in a post a few days ago. Some speculation was that this was basin and range rifting, but Albert noted that it’s most likely a result of dehydration in the soil causing a loss of volume (resulting in cracks). I know, it is the beginning of the end of time statement that caught my attention. ” But we will not be fooled. Hell is down in that hole, and it will come forth and claim us all. Repent, repent, we are doomed………………….” Lol, I guess it was a spoof. My mind was still reeling from the Noah’s Flood article. http://www.igepn.edu.ec/cotopaxi/camaras-cotopaxi looks like Cotopaxi is degassing (is that the right word?) a lot right now. It could be a very accurate word. The problem is that in highly energetic degassing, it could carry shattered rock with it. If the source of the gas is water flashing to steam, then it’s a phreatic eruption. If the source is SO2 or CO2 nucleating in liquid magma, or from a mush, it’s become an actual eruption if it is energetic enough. If it’s just gas seeping up from the depths, the only way you may detect it is via gas monitoring or off of the SO2 optical depth instrument. If what you are seeing is essentially steam wafting off of the mountaintop, then yes, it could be degassing, or groundwater being heated to vaporization, though not explosively. It is worth mentioning that Far North Queensland has potentially ongoing volcanism that is independent of the trend toward younger eruptions as you go south. In particular refer to the comparatively recent maars of the Atherton Tableland, Lakes Barrine and Eacham, dated at approximately 12MYA. These eruptions are apparently referenced in the legends of the local tribes. Apologies for the typos & grammatical errors above. A few too many Coopers Pale Ales under my belt on this Melbourne Cup day. Yes, the volcanoes in this region are mostly young. I found it difficult to find much detailed information on them. One paper claims a similar age gradient as to the other chains, another paper claims there isn’t. There is also one much older date reported in the region which fits the other chains. From the maps, my guess would be a relation to the interaction with the New Guinea region. Out at first… not the runner, the 1st baseman. do it. Quit when I ‘m ahead too..
That had to hurt. My new hip twitched in reflex. Rinjani in Indonesia is erupting: Bali airport has closed. A volcano with history. Is there a webcam on it? The girl didn’t seem too concerned about that catcher. Just calmly walking. I don’t think he’ll be playing for a while. I played a season of (fast pitch) city league here and ran across these holier than though players who think that their experience in various school leagues growing up make them Über. What they typically fail to realize is that age affects us all. Those ligaments might not stretch the way they used to… and your vision and estimates of ball position might not be what it used to be. Our pitcher found out that he could only hurl so many fast balls before his shoulder started giving out. Our particular team was just a bunch of military staff from various bases playing against teams from other businesses and such. Our only advantage was that as a group, our cardio fitness level was better than most. We also had an innate ability to follow assignments with little to no argument. Other than that, we lost. (But we still got good marks on our evaluations for community involvement). Bit of rumble and a star under Barda/Iceland last few hours. 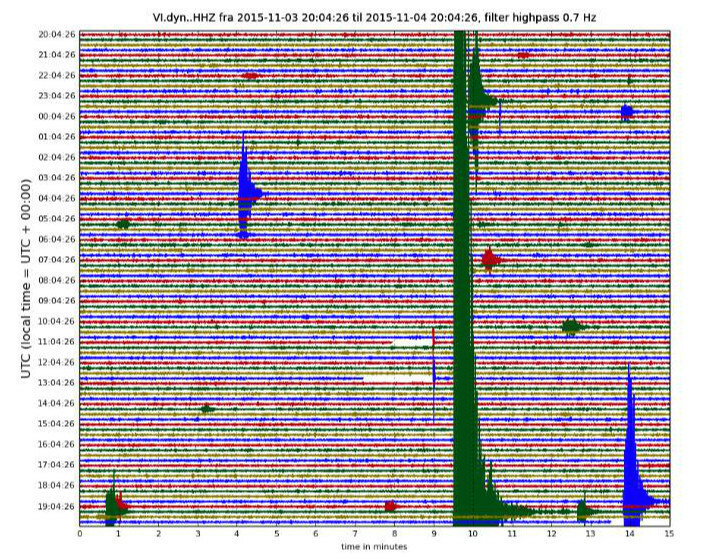 The quakes are lining up along the north rim (seems) nicely. …and, evidently I’m a pessimist. Always watching for the next “bad” thing that has to be dealt with. Pessimism probably increases survivability. Yep. You called that one. Quite interesting. The season’s coming. Just a cautionary note, nothing goes up quite as fast as a Christmas tree. Sap laden, dry, it’s a fire waiting to happen. Once the room reaches and maintains a high enough temperature, most of the contents will ignite at the same time. Oh, and burning couches and carpet are an excellent generators of poison gas. About the picture. It’s supposed to be a fire research lab. Why the observer is wearing what appears to be a tyvex chemical exposure suit is beyond me. It’s from a TV program. Logic doesn’t generally rule.